Water, Jalapeno Peppers, Ancho Peppers, Tomato Paste, Onions, Cascabel Peppers, Garlic powder, Iodized Salt, Soybean Oil, Spices, monosodium glutamate, citric acid. Agua, Chiles Jalapenos, Chilles Anchos, Pasta de Tomate, Cebollas, Chiles Cascabel, Ajo el Polvo, Sal Yodatada, Aceite de Soya, Especias, Monosodio Glutamate, Acido Citrico. I am able to find other Herdez salsas in my local market, but the Ranchera is never available. I used it on my huevos this morning. 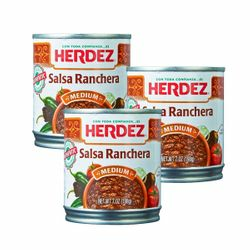 I think this salsa is great on egg, sausage and cheese taquitos but I can't find it at the grocery stores. Central Market use to carry it but quit.